Between all the forum buzz after D23 and school starting I got a little behind on blog posting. I need to stop putting all my thoughts out in the message boards and be sure to also post them here. Ever since the announcement of the new Star Wars and Toy Story lands, one question has been asked over and over throughout the internet: “Where will they go?” Disney has announced that Star Wars in Disneyland is going to take over the Big Thunder Ranch area but no announcements have been made yet for Hollywood Studios. Here are some of my thoughts on where these new sections will be placed within the park. When it comes to Toy Story Land there is a general consensus that it will be in the back lot area behind where Toy Story Mania is currently located. Though there is some disagreement on exactly how far north and south it will extend and what other attractions it might force to close. 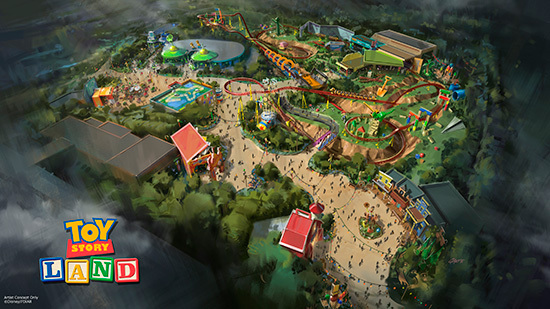 The reason people believe this is that it is the most logic placement for Toy Story Land is that many people think the building in the bottom left corner of the concept art is the existing Toy Story Mania building. Because the Back Lot Tour has already closed, this placement would not really effect any of the existing guest experiences. It may cause some issues for park operation though. The costuming and props buildings and the practice yard for Light Motor Action would have to be demolished along with some smaller park operations offices. The part that the internet cannot agree on is if this expansion will affect some other attractions. Some believe that One Man’s Dream and Little Mermaid will need to be demolished for this expansion. I, personally, don’t think they need to be destroyed for this expansion. We know that the Animation Building is in the process of being converted into Star Wars Launch Bay so that is not going to be torn down. Also, since the Animation Building is staying, for now, I think it’s safe to assume that the animation courtyard is safe too, along with Little Mermaid. One Man’s Dream I think will stay until near the end of the Toy Story Lands construction as the building will provide a nice buffer between the presumed construction area and guests. If they do keep that building I believe that the covered path between the Toy Story Mania and One Man’s Dream building would offer a great portal to enter the area. When it comes to Star Wars Land there is some disagreement regarding its possible placement. The most popular theory suggests that it will extend north of Star Tours taking over Indiana Jones Stunt Show, Echo Lake, and part of the parking lot. I disagree with the theory for a few reasons. The first reason is due to the visual appearance it would create, both inside and outside the parks. Standing on Hollywood Blvd and turning to see an alien world just seems too visually jarring. Also if the expansion would be placed there from the parking lot you would see the supports of the facades. From the concept art it seems as if the area will be ringed with taller features, like the mountains at Carsland. If you look at Carsland at DCA they didn’t bother with the side facing outside the park. The difference here is that it would be facing a guest area (the parking lot) while at DCA it faced off Disney property. They could create a 360 set piece but that increases costs. Secondly, the part of the parking lot that people think will be taken out is the handicap parking. The rules concerning these are complex so I’m not sure if trying to move them will cause problems. Parking lot changes are coming to Hollywood Studios, but if they got rid of that current grouping they would need to build another block somewhere else first. Finally, this plan would result in a change to the ring road. Ring Roads are important parts of the park’s operation. True, moving a road is not that large an issue in the big picture but it would represent another inconvenience for Disney while construction is happening. In the same vein, this placements would result in the loss of a lot more of the back lot. The other popular placement idea is that it would extend Westward taking over New York Streets and the Muppet’s area. I, personally, feel that Disney is signaling this placement for the Star Wars Land expansion. It would eliminate Muppets and Light Motor Action but word is that those are on their way out already. The Hyperion Theater Building and Commissary Way create a good visual block so the land can blend in better to the surrounding areas. This would create better reveals to guest as they enter the land. Imagine walking past Sci-Fi Drive in, seeing a sign saying “Now Showing Star Wars” and then a fence or trees act as the gateway into the work of Star Wars. In this placement the backside facades would only face the lesser used S Studio Drive entrance which might be gone after the parking lot improvements. Even if that entrance remains open the ring road and the existing trees provide lots of visual cover. The Lights Motor Action corner also offers good cover for ride buildings and back lot areas. Disney also just recently announced that this is the last year for the Osborne Lights. In my mind, if the construction was going to be towards the parking lot then why not extend those for another year longer to help draw guest. Since they are not, it seems they are expecting Streets of NY to be close and replaced by either part of Toy Story or Star Wars. This placement doesn’t effect the ring road or the back lot. There is a third positioning that is very unlikely but has been suggested more then once. If Disney were to get rid of the two Studio drive entrances in favor of one main Victory Way entrance then it would open a lot of land. Disney would be able to increase the foot print of the park stretching it out to the drainage creek. This would preserve almost all other attractions in the park (minus the back lot quick service area next to Indiana Jones) and open up land for other future expansions. This would also allow for the construction to be completely isolated from the guests and probably operate more efficiently. This placement would have the same issues, as other builds, with regard to facades and ring road but if they were going big enough to expand the foot print of the park I doubt this would be too much of a worry. Here is a rough graphic of where I think the areas will end up. I feel like Hollywood Studios needs a cohesive theme. Before DCA got their Carthay Circle upgrade, it was this melting pot of ideas that didnt flow together. That being said, I feel like Disney wont let Toy Story land and Star Wars land touch. At the end of the day, there is still the Chinese theater crowning the park. Hollywood Studios is in need of dire help. Disney made Hollywood studios as a rival to Universal. Disney has made history on blazing new trails and NOT copying other parks. In terms of where Star Wars land is going, I could see a combo of Idea #2 and #3. The park is small and it shows. Hell even moving the entrance close to Port Orleans would give them ample space for anything they dream up. Based on some recent stills from a YouTube video (https://youtu.be/UGLO9dBt8tg?t=21s) it looks like your third and unlikely scenario is the one that is coming true for Star Wars. You can clearly see they have cleared land south of S. Studio Drive out to the drainage creek. My guess is that road is going away. As far as work going on in the old studio area it looks like they cleared up to the multi level parking lot to the north. 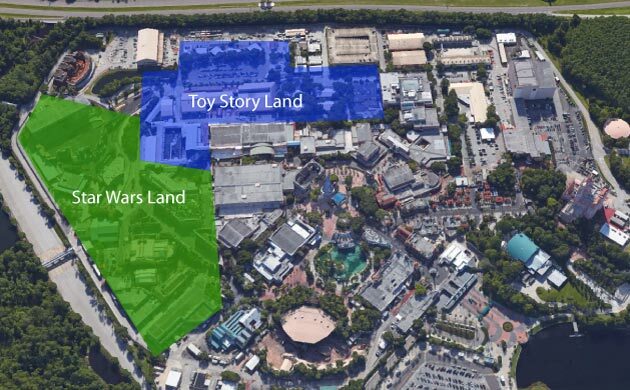 This is going to be a really big expansion of Hollywood Studios. I’m looking forward to it.